PRODUCT: GSSI #5697, High Temperature Self Adhering Double Sided Butyl Rubber Sealant Tape. 3/8" Wide X 3/32" thick X 50 Foot roll with easy-release silicone coated paper. Price/Roll. MB-10A is a the finest butyl sealant available on the market. Its a premium-grade high-temperature, high-adhesion, high-performance elastomeric butyl rubber sealant which meets all the critical requirements of metal buildings, high elevation buildings, curb mounts, high vibration penetrations like RV roofs, and other critical structures. The GRAY color distinguishes it from lower-grade black color butyls on the market. Also meets or exceeds all sealing requirements for the window glazing, air-conditioning, and refrigeration industries. 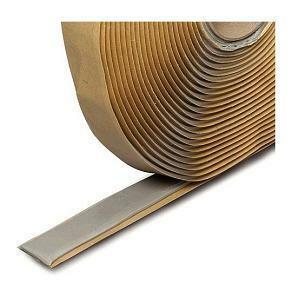 The Butyl Rubber Tape is extruded on silicone-coated paper for easy application. Made in N. America with USA materials. High Temperature / high performance Butyl-Tape is available in many different sizes and lengths to fit application requirements. MB-10A provides many qualities that result in a superior seal, greater longevity, and easy application. FDA compliant. Meets Mil Spec MIL-C 18969B Type II Class B. * The rolls are packaged in water-resistant cartons for job site storage and export convenience. Service Temperature: -60°F to 275°F. Application Temperature: 35°F to 110°F. Bonding Time: Immediate water tight seal. Full bond in 24 hours. Tensile Strength: 25 pounds per linear inch. Cold Temeperature Flexibility: Excellent, passes 1/2" mandrel bend @ -60F.